Although the most popular time of year for a wedding are the summer months (this is when we are the busiest with our wedding stationery), The winter wedding is fast becoming a popular choice for the bride and groom. I used to think that is was because all the wedding venues were booked up years in advance during the summer, but I am starting to see a trend on ceremonies around the Christmas season. Why not combine a wonderful white wedding with the festive months? There is so much scope for decorations, bridal wear, and venues and since we can never rely on the summer weather, it is the perfect opportunity to go all out winter wonderland! Here at Honeytree we are always intrigued to find out about our brides, where they are getting married, how many guests, what the dress will look like, what flowers are chosen, these questions are often asked to the bride by our creative department, as we like to tie in our stationery with the theme of the wedding. 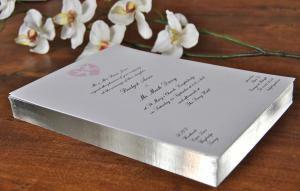 Be it at a country house hotel, or a swanky city venue, we like to create the wedding stationery to reflect the day. Our wedding stationery often features an illustration that can be found in the gallery (there are over 2000 illustrations to choose from) but we are seeing more frequently that our brides would like something special that reflects their day, so we can create an illustration or illustrations that is personal to them. These illustrations can be carried right the way through the wedding stationery, starting with the save the date cards and ending with the same illustrations on the Order of Service booklets, name place cards, menus, and seating plans. We love helping our brides and grooms to create their personalised stationery and what is better than a beautiful invitation to set the scene for your wonderful winter wedding? HoneyTree Publishing Ltd 01749 899 333.